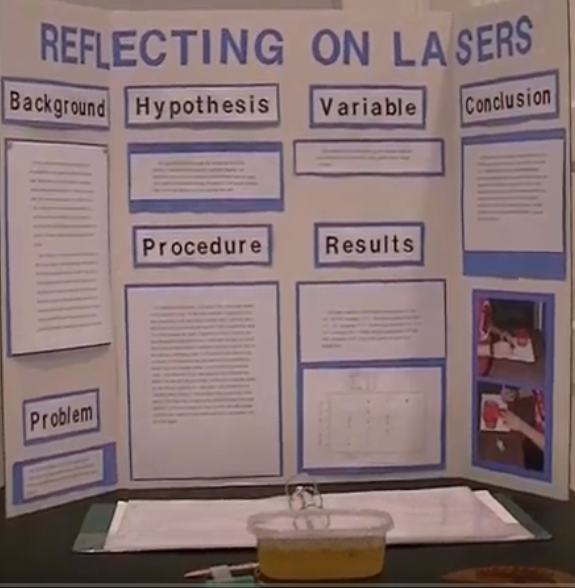 Logan, an 11th grade student from the state of Georgia in the U.S. did an experiment called Reflecting on Lasers Science Fair Project. My hypothesis was that through the plastic container the reflective angle will be between ten and thirty degrees. My hypothesis for my second question was that through water the angle would slightly increase and through the gelatin it would greatly increase. I did not believe the laser would pass through the milk. To begin this experiment, I purchased some clear Kroger brand gelatin from the grocery store. All the other materials (plastic container, laser, protractor, Kroger brand 2% milk, and water) I already had. I mounted my laser to a rubber eraser to steady the laser. I first measured the empty plastic container by shooting the laser through the edge of the container. I marked a small box on the side of the container to shine into each time. Before I tested the milk, I made sure to clean out the container. I prepared the gelatin according to the instructions included on the box. After that I preformed the test with the gelatin. I used the protractor to measure the angle from the laser at the entering and exiting points and recorded all the angles in my notebook. I took three readings of each condition and took the average to insure I have an accurate reading. The empty container yielded angular measurement average of 121.7°. The water test average was 137.7°. The Milk gave an averaging of 125.7°. Finally, the gelatin resulted in an average of 149.5°. From the data I gathered my first hypothesis was incorrect. My second hypothesis was partially correct. I was wrong in that the laser would not pass through the milk. I was correct in that the water’s reflective index would result in a minimum increase; it only increased by ten degrees. This entry was posted in abstracts and tagged 11th grade science fair project, easy science fair projects, homeschool, laser science fair projects, laws of reflection experiment video, physics experiments based on light, reflecting on lasers science fair project, reflection of light experiment mirror, science fair project, science fair projects with lasers and mirrors, science projects.